William Crawford Young was born in Cannonsburg, Michigan, on March 26, 1886, according to his World War II draft card and New Hampshire death certificate. The 1900 U.S. Federal Census recorded Young’s first name as Willie, who was in his paternal grandmother’s household; she was a widow. Young’s father, Gaylord, was a widower and a painter; Henrietta was the name of Young’s mother. Also in the household were his older brother and two younger ones, as well as an uncle and servant. They all resided in Cannonsburg. Many newspapers, including the New-Dispatch (Endicott, New York), April 26, 1923, published the syndicate profile of Young to promote his strip Clarence, which debuted July 10, 1921 and syndicated by the New York Herald. 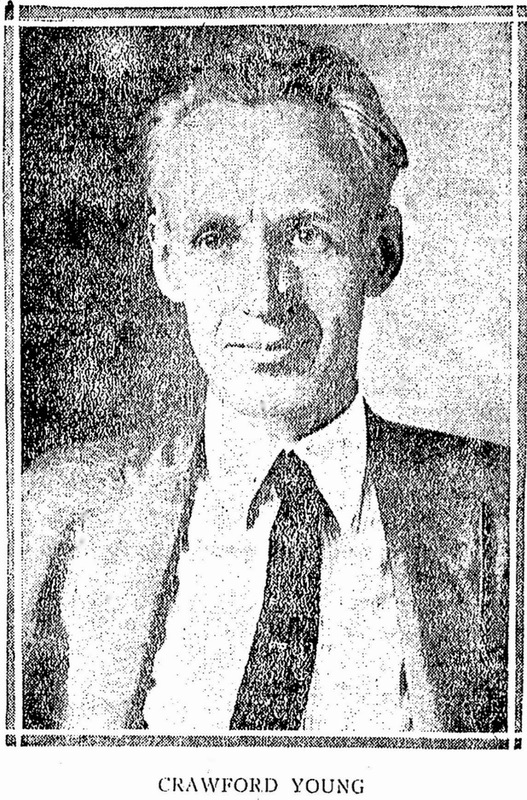 Crawford Young, creator of “Clarence,” which appears every Thursday in this paper, and whose shining morning face appears above, was, like many other men who have made their name in cities, born on a farm. The particular farm, in Mr. Young’s case, is situated near Grand Rapids, Mich., and up to the time that little Crawford was 15 he never saw a railroad train, although he followed the parental plow he used to hear the whistle. This youngster worked as a farmhand until he was 19 years old. But in all this time, his dreams were of art school and the drawing board and pencils which would follow. So for four years he hoboed through the West, working in the summer, as a milker on a dairy farm in Wisconsin or a “rider” on a cattle ranch in Texas, and saving his money to spend the winter at the Art Institute in Chicago, where he had learned the rudiments of drawing. Then came his first job. It was with Montgomery Ward and Company. The young artist was put to drawing illustrations of socks which were to appear in the catalogue of that vast mail order house. After unceasing labor making socks look attractive, Mr. Young went by rapid degrees up the dizzying ladder of promotion until he was set up to drawing baby-buggies. For this, the hardest job of illustrating in the catalogue he was paid the regal sum of seven dollars a week. When Crawford had drawn his 342d baby-buggy, he looked for another job, and got one on the Chicago Dally News, drawing comics for the back page. Mr. C.D. Dennis, the managing editor of that great paper, thought Young was a keen, ambitious young man, and he decided that Young should draw political cartoons for the front page. So our hero packed his kit. and bought a ticket for New York. He worked as a staff artist on Life for the next ten years. And in the meantime, bought himself a farm out in Connecticut, so that he could come into town when he needed to go to the bank and get some money to buy seeds with. “I thought that a comic in which there is portrayed the little tragicomedies of real family life is the kind of a comic American people like best. “Clarence,” unlike most of comic husbands, is a big man. Most of them are little men with a big wife. However, everybody recognizes that a big man henpecked by a little woman is a lot funnier than a little man henpecked by a big woman. Hence “Clarence” is a big man. and his Better Half is diminutive. According to the 1910 census, cartoonist Young and his brothers lived in Chicago, Illinois at 6333 Throop Street. Young contributed to a number of magazines including Puck (here and here), Everybody’s (here and here) and Judge. The New York Sun, December 2, 1916, mentioned Young’s book. A family tree at Ancestry.com said Young married Effie Beach in 1918. On September 12, 1918, Young signed his World War I draft card. The self-employed artist resided in Norwalk, Connecticut at RFD 43. His description was medium height, slender build with blue eyes and light brown hair. Norwalk would be Young’s home into the 1930s. The 1920 census said Young was a freelance magazine illustrator. He had a 13-year-old step-daughter. City directories from the 1920s said he lived on Comstock Avenue North. Biographical Sketches of Cartoonists & Illustrators in the Swann Collection of the Library of Congress (2012) said Young was on the staff contributor to Life and the New York Herald (see column five). For the Herald, Young produced The Finkles, from October 31 to December 26, 1920, and the aforementioned Clarence. In 1929, Young took his family to Europe. According to American Newspaper Comics, Young created Mortimer and its topper, Pearl Button, in 1929, and The Tutts in 1933. Both were for the King Features Syndicate. Young’s address in 1930 was 180 East Division Street in Norwalk. In 1936, Young was granted a divorce in Florida. The New Hampshire Marriage Records, at Ancestry.com, said Young wed Charlotte Crockett Whittier on August 22, 1936 in Northwood, New Hampshire. The Telegraph (Nashua, New Hampshire), April 26, 1938, reported the fire on Young’s property. For Syndicated Features, Young produce The Jamms strip which ran from July 13, 1936 to March 8, 1937. It appeared in the comic book Best Comics numbers 1, 2, 3, and 4, from November 1939 to February 1940. Young has not been found in the 1940 census. He signed his World War II draft card on April 27, 1942. He lived on Cross Highway in Westport, Connecticut. Young passed away April 1, 1947 in Strafford, New Hampshire, as recorded on the New Hampshire death certificate. Do you know anything about Young's friendship with the artist/illustrator Don Freeman?